There are a lot of questions about CNC or machine engraving in various support groups. Many of the answers given are often incorrect or incomplete. I hope this page will help demystify what some see as a difficult task. One of the prime requisites is correctly ground tools. I'll start with that and add further information as time permits. Here is a drawing containing information gleaned from various commercial engraving cutter manufacturers and personal experience. For PCB engraving 60� clearance angle works well, but carbide cutters must be used! A HSS bit will blunt very quickly - it really is much better to photo etch if you can! For general work I find 30� clearance angle is good, they can be used on steel but will loose their edge quicker than a 20� ground tool. Tip Side Relief angles of 10� and Back Relief angles of 5� seem to work well for all materials. Normal Included angles are 40� or 45� and 60� for Stainless Steel. NB - Note that the tool is ground with the tip effectively "offset" so only one cutting edge contacts the work. This is done on some grinders by using a cam action, but the easiest way is to angle the tool upwards about 5-10� whilst rotating it against the wheel. A tool without clearance will rub, often ruining the work. On some plastics melting sometimes occurs, remove the trailing edge of the tool completely, these are known as "quarter ground tools". Also some materials produce a burr, increasing to a 60� included angle tool usually fixes this. 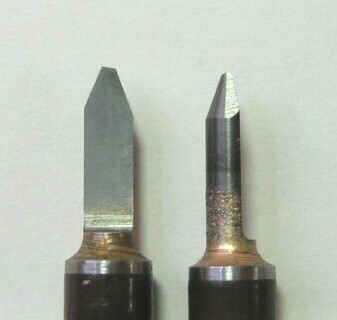 The picture left shows two 40� Included Angle carbide tipped cutters, the reflection on the tip of the right hand tool is from the flat on the 30� clearance angle. 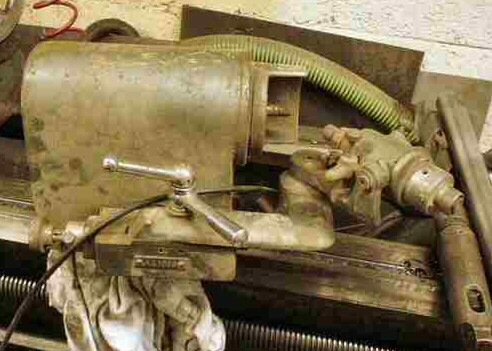 The 10� side relief angle can clearly be seen on the left hand tool. For those who want to build a dedicated engraver, have a look at Majosofts engraver page. Here are the before and after pictures of a Dowling Engraving Cutter Grinder I recently bought. A pair of new spindle bearings, a wheel backplate, plenty of cleaning and a coat of paint was all that was required to get it back to working order. Still a couple of bolts to replace with Knurled screws but it's working. Prior to this I got all my tools from, and sharpened by, Suregrave. For the cost it is still worth buying all but specials from a commercial supplier/manufacturer. 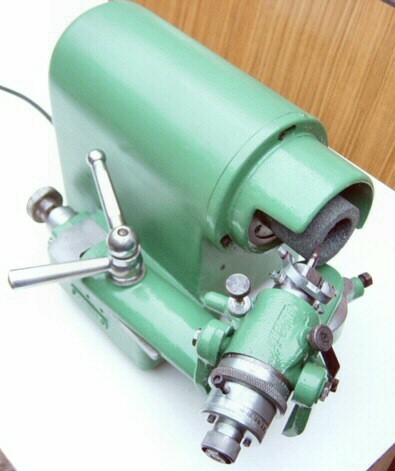 It will be used mainly for sharpening and re-grinding existing tools. Looking at the tool holding system, it would be easy to adapt to grind small lathe tools, d-bits, and drills too. Dowling no longer make these, or Engraving machines, but still had a manual that they kindly sent me. Chatting to them I got lots of useful information. They used to rough hand grind blanks, semi finish on a green wheel, then finish grind to size and edge on a diamond wheel. I have a diamond wheel on order, and have a collection of semi finished and blunt tools waiting to go! Return to the main index page or to my Engineering page.